Hawaiian Treasure Slot | Is it Fun Enough or Will Get You Bored Pretty Fast? Ash Gaming provides you with a great opportunity to experience the mesmerizing Hawaii islands from the comfort of your home, as well as reap some solid cash rewards while delighting in the tropical paradise-themed slot machine. The vibrant 5-reel title is played across 10 paylines, and falls into a low-variance category,(Starburst, Well of Wonders, Blood Suckers…). Nevertheless, the exotic game is highly entertaining and can still cater to the needs of most casual players, or those who need a good introduction into the slot world, given that the rules and the whole layout are very simple and straightforward. What makes the video slot unique is also the fact that Scatter symbols are also Wilds in the game. The top prize up for grabs equals 1,000x your bet. The RTP of 96.29% is very solid, although it’s lower than what the best slots online can offer. Hawaiian Treasure offers barely any breakthrough as far as the theme is concerned. There is endless number of titles centered around various sought-after world destinations. Still, the layout brings a clean, clutter-free layout that is easy on the eyes and can smoothly immerse you in the gameplay. Colorful flora and fauna paired with beautiful skies serve as the backdrop to the reels, whereas the main symbols include the beach-related items, such as wooden boats, turtles, native drums, and yellow and red flowers, to name a few. Tiki masks are interesting in that they can assume the role of both Wilds and Scatter icons. The latter is responsible for triggering the Free Spins feature, which is, truthfully, the biggest draw of the slot. The Ash Gaming title revolves around the Free Spins feature. Actually, if truth be told, that is the only Bonus feature available in the game. To trigger the free games, you are required to land three Tiki masks anywhere on the first, third, and fifth reel. That will in turn provide you with 12 free spins (definitely not the most rewarding free spins feature). You will, additionally, be prompted to another screen where you will be asked to select three masks out of a total of five of these. The chosen symbols will be the only one popping up during the free spins, which will further boost your winning potential. Unfortunately, the Free Spins feature cannot be re-triggered. Last but not least, the top prize of 1,000 coins is awarded once you succeed in landing five Hawaiian girl graphics on a single payline. 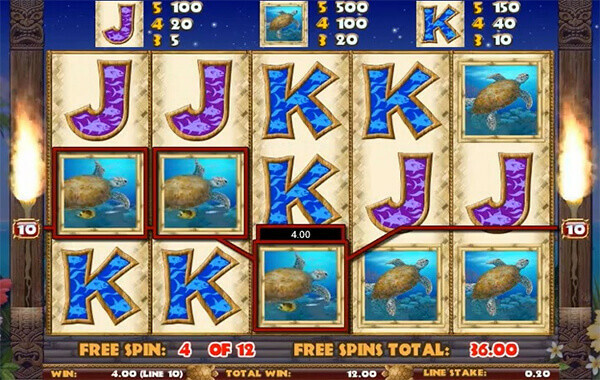 With five reels, ten paylines and rather basic structure, the Hawaiian Treasure slot is a great choice for novice punters seeking an entertaining and fairly simple old-school game. It will not turn you into a millionaire but will definitely keep you spinning for hours. The island-themed release features a theoretical return to player (RTP) of 96.29%.